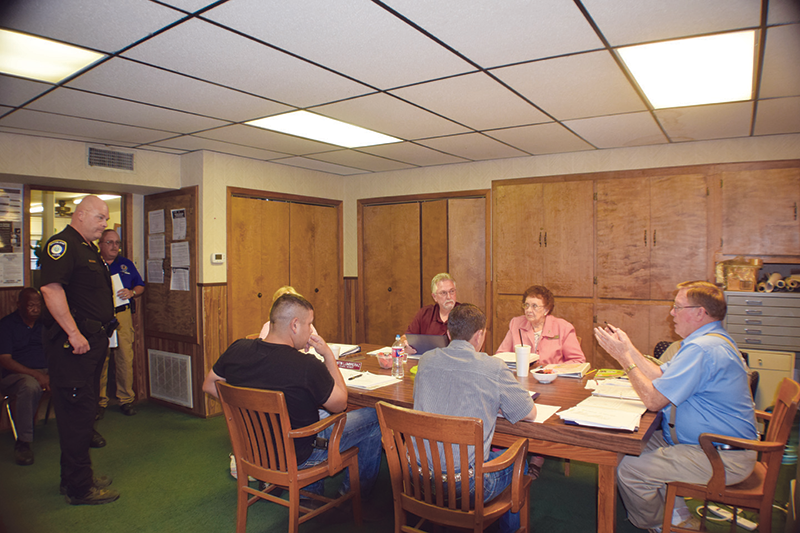 GRAPELAND – The proposed Fiscal Year (FY) 2017 tax rate for the City of Grapeland was discussed during the most recent meeting of the Grapeland City Council held on Tuesday, Aug. 10. Mayor Dailey said total land value after all exemptions had been taken out was $35,362,860. Based on that figure the effective tax rate had been calculated at 0.610526 per $100 of property valuation. Following several minutes of discussion, the council voted to approve the proposed tax rate at the effective rate of 0.610526, an increase of 0.0006. Prior to the tax discussion, Brandon Bridges with the Grapeland Economic Development Corporation (GEDC) provided the council with the organization’s quarterly report. He also discussed a community development grant the GEDC was interested in providing. “This is something we would like to institute on an annual basis. This year to kick it off we approved a $15,000 budget. Basically, it would allow a business, non-profit, individual or local business owner to apply for it. What it boils down to is that it would have to be for business or public use. We discussed potential candidates such as the library or any other small business in town,” he said. The community development grant budget, board of directors’ list and quarterly reports were approved by the council. The council adjourned into executive session at 8:45 pm. to discuss real property negotiations. When they returned over an hour later, the council approved a motion allowing the GEDC and mayor to initiate negotiations with a potential business looking to possibly relocate to Grapeland. A resolution was rescinded to name GrantWorks as the city’s grant advisor in order to comply with USDA regulations. Grapeland Resident Ronnie Martin voiced his concern about dogs running loose throughout the city. Agenda items pertaining to an administrator and engineer for a CDBG grant were tabled for future deliberation. The implementation of a new school program coordinated with the Grapeland Police Department was tabled for further consideration. Municipal Judge Kathy Bush reported the Municipal Court collected a total of $5,8846.43 comprised of $3470.30 in city revenue, $1,723.00 in state revenue and $691.13 in delinquent fees. There were 17 citations written, 28 total dispositions, 10 warrants issued, three pro capias fines issued and three magistrations. Grapeland Police Chief Kyle Duren reported his department had recently seen a decline in burglary calls but an increase in disturbance calls because of the heat. Chief Duren further reported the police department responded to 63 calls during the month of July. Grapeland Fire Chief Roger Dickey reported the Grapeland Fire Department responded to two rescue calls during the month of July. There were also 15 EMS calls during the month. Mayor Balis Dailey reported the city used 6,630,000 gallons of water from the municipality’s water wells. There were 8,100,000 gallons of water sold during the month of January and 3,011500 gallons of wastewater were treated, for a daily average of 130,547 gallons. He further reported the lab analysis of the city’s water was well within the allowable standards and there were no leaks to report. The monthly profit and loss statement, budget adjustments and the payment of current invoices were approved by the council. The minutes of the July 12 and 28 meetings were also approved. Next articleLife on the Farm?